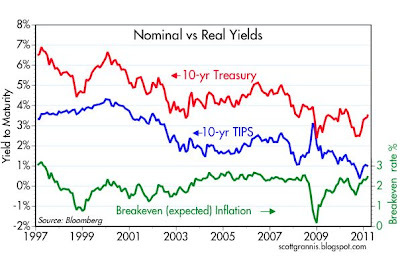 This next chart shows the same analysis, using 10-yr TIPS and 10-yr Treasuries. Again we see inflation expectation rising in recent months. It's probably not a coincidence that inflation expectations have been on the rise ever since the Fed first floated the idea of QE2 in late August of last year. 5-yr inflation expectations have risen from a low of 1.2% in late August to a current 2.6%. That's significant. 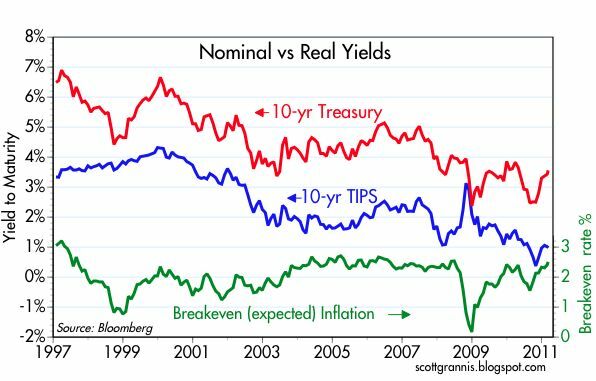 To be sure, inflation expectations today are not out of line with the experience of the past few decades. TIPS are priced to the expectation that the CPI will average about 2.5% for the foreseeable future, whereas the CPI has averaged 2.6% over the past 20 years. 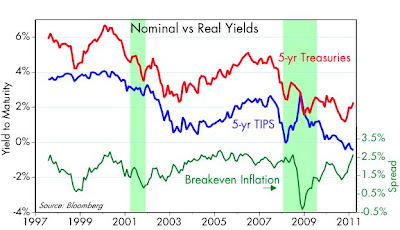 But what stands out is that there now is no longer any trace of deflation sentiment left in the bond market. QE2 has wiped out deflation fears. This may have helped the economy improve, since it eliminated the fear of deflation and thus improved confidence on the margin. I think there is a good case to be made that QE2 should be retired, because it has served its purpose. There is no need for the Fed to wait to see the employment numbers improve—that's like driving by looking in the rear-view mirror. The Fed should be forward-looking, and all the forward-looking indicators suggest that the economy is clearly on the mend. Easy money won't make the recovery any more solid from this point on. Easy money that overstays its welcome will only begin to generate real inflation fears, and that can sap confidence and weaken the economy just as deflation fears did. We already see all the portents of a significant rise in inflation: a very weak dollar, and soaring gold, oil, and commodity prices. Those prices will be validated if the Fed continues with QE2 for too long, and that would likely lock in a permanent upward shift in the general price level.